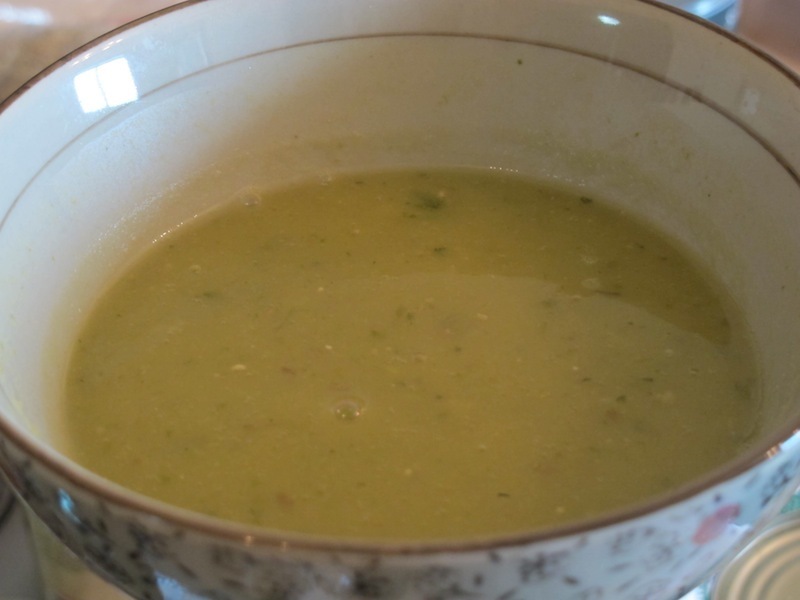 The first time my mother served this soup; my brother and I were freshly in our teen years. His blue and sparkling eyes looked at me full of disgust, they were saying this is definitely the worst soup in the world. I agreed, slimy, gelatinous texture, strong flavor. Few minutes later after a short but spicy argument with our mother we were obediently eating f**** soup trying not to think about the new entry on our You must eat that and I do not want to argue Menu. This soup was here to stay. After a full year of cooking only macrobiotic, low fat, almost no meat, fresh and raw my mother decided that going to extreme is not good for her and that her blood type 0 deserve meat diet. At the time we were visiting and consulting several alternative experts regarding her MS diagnose and one of them convinced her that the veal tendons contain something (I completely forgot what) very good for brain synapse recovery. 25 years later I adore deep, slimy and meaty flavor this soup has. Despite the promise my teenage brain made not to ever eat this soup when I grow up I cook it regularly. 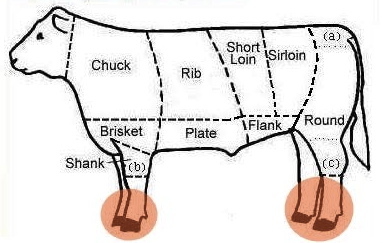 These bones are not easy to find; I have to pre order them from my butcher. Antonio cooks them privately at home and like to eat them but he’s not keeping them in the shop because nobody buys them. Add turmeric, fish sauce, garlic, chili, sugar and coconut milk to the stock. Bring to a boil, add cubed chicken breast and cook for 5 minutes. Reduce heat and add sesame oil and peanuts. 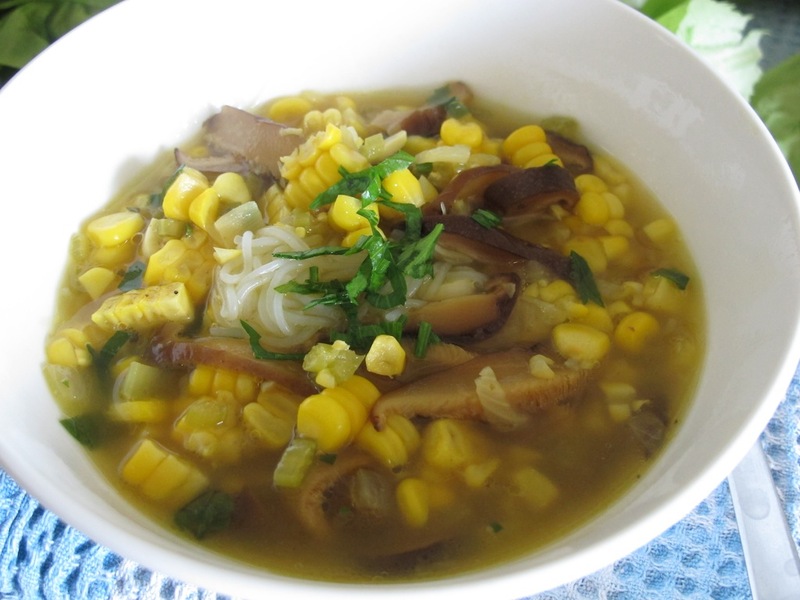 Assembly – place rice noodles in a bowl, add some bean sprouts, cover with soup and garnish with spring onion. 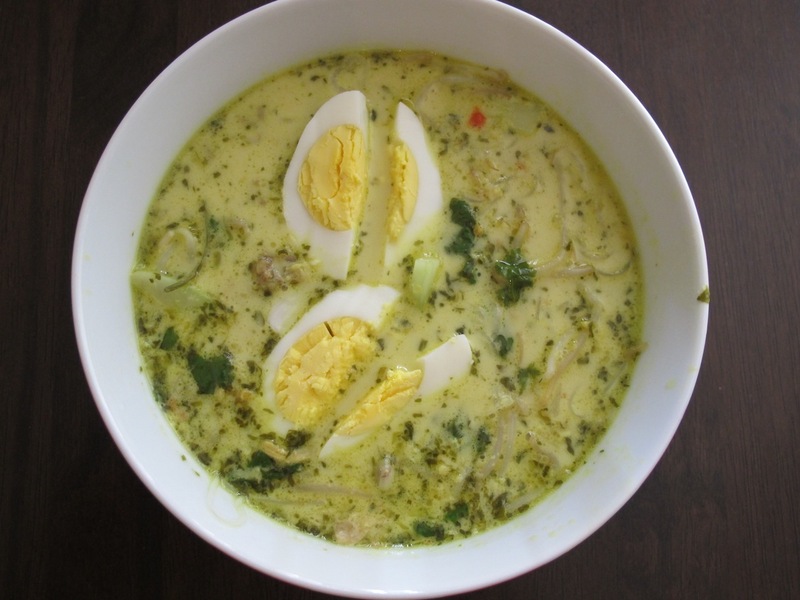 Laksa is a popular spicy noodle soup found in many Asian regions, especially Malaysia and Singapore. There is no one specific way to make Laksa, for it has been altered over hundreds of years, and each culture – and even person – has a unique signature recipe. The most important step is to make your own spice paste – unique to your own liking! I don’t like it too spicy, so i cut the amount of chilies in half and we are using olive oil instead of peanut oil. Combine lemongrass, chile peppers, galangal, ginger, shrimp paste, shallots, garlic and peanut oil to a blender or food processor. Pulse until well combined. 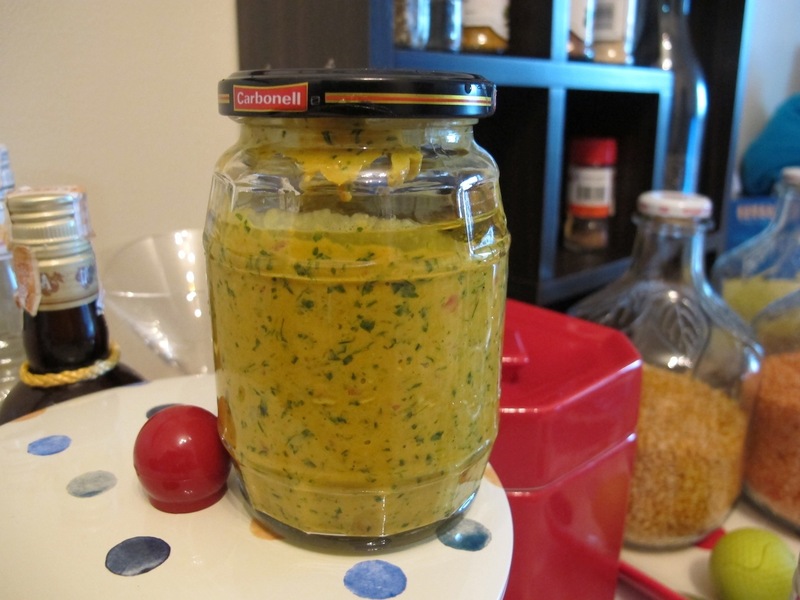 Blend in the cilantro, turmeric, sugar and tamarind and pulse until it has made a paste. Reserve until ready to use. Make paste one day ahead of time for flavors to blend. Heat oil in a large pot over medium heat. Stir spice paste into oil and heat for a few minutes. 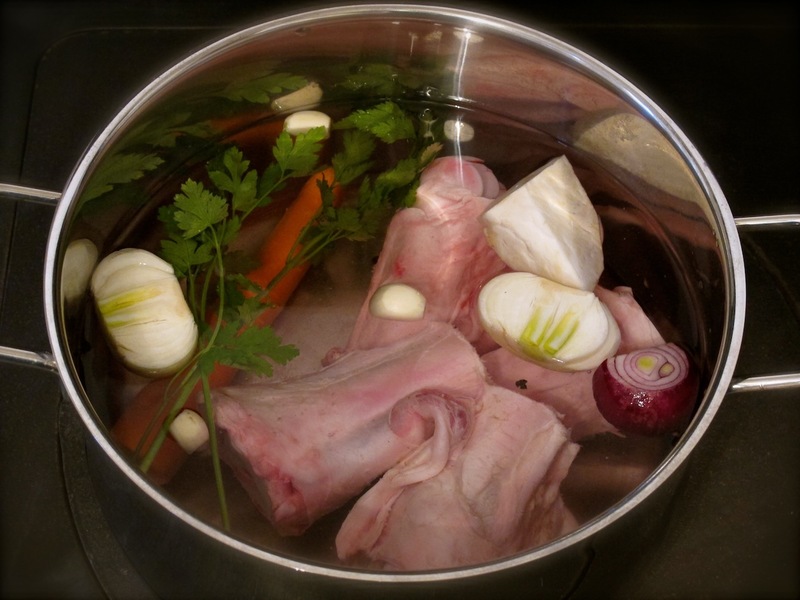 Add chicken stock and let it come to a boil. Lower heat to low and add in cilantro, basil and fish sauce and let gently simmer. When ready to serve, stir the coconut milk into the hot broth. Place precooked noodles in a large bowl and top with chicken or shrimp and pour broth around noodles. Top the soup with garnishes and squeeze a lime over soup. Melt the butter in a a pan over low heat. Add the onion and sauté until soft, storing occasionally, around 5 minutes. Add the peas and water and bring to a boil, simmer on medium heat until the peas are tender (3 – 4 minutes for freeh peas, 10 minuter for frozen). Add 2+1/2 cup of the milk and season with salt and pepper. Bring to a boil, stirring and watching so it does not get burned or boil over. 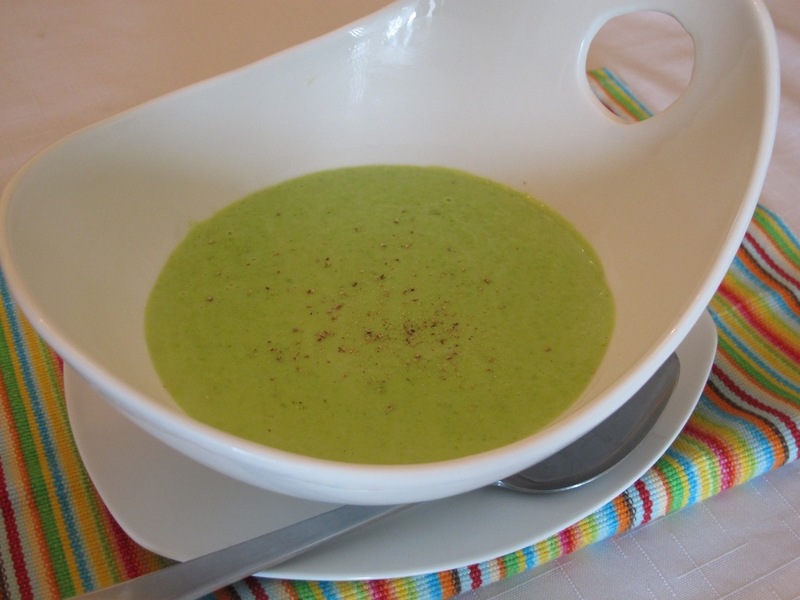 Remove from the heat and blend the soup with hand blender until very smooth. Bring the soup back to the boil and if it seems too tick, heat the remaining milk in a small pan and stir it to the soup. Reconstitute shiitake in hot water and chop them up after 10 – 15 minutes. Infuse the stock with saffron. Boil the chicken stock, remove from heat and add saffron, cover and leave for 5 minutes. Heat the oil in the pan. Add the onions and celery an cook on low heat, stirring occasionally, until softened. Add garlic, cook for another minute. Increase the heat to medium, pour in the saffron infused chicken stock, add mushrooms, pepper and nutmeg, and bring to a boil. Reduce heat and cook covered for 25 minutes. Increase the heat and add husked corn, sage, parsley, marjoram. Season with salt. Reduce the heat and cook for 10 more minutes. Meanwhile cook the rice vermicelli and drain them. Put small amount of vermicelli in a bowl and ladle the soup on top of it. Garnish with fresh parsley. Wash well split peas. Change water few times until clear. Drain. Heat the oil in a large pan over medium heat. Add the onion and cook over low heat, stirring, for about 3 minutes, until slightly softened. Add garlic and cook for 1 more minute. Add split peas, water and bay leaves, bring to a simmer. Skim the scum off the top of the soup for few minutes, until the scum ceases to rise. Cook on low heat for about 1 1/2 hours, or until peas are tender, stirring occasionally in case they stick to the bottom of the pan. Remove the bay leaves from the soup. Purée the soup with an immersion blender. Add salt and pepper to taste. Bring a pan of water to a boil. Add the barley and cook over high heat for 5 minutes. Skimming any foam and impurities from the surface. Remove from the heat and set aside. Melt the butter in a large pan. Add the onion and cook over medium heat, stirring, for about 3 minutes, until slightly softened. Add the leek and cook for another 4 minutes. 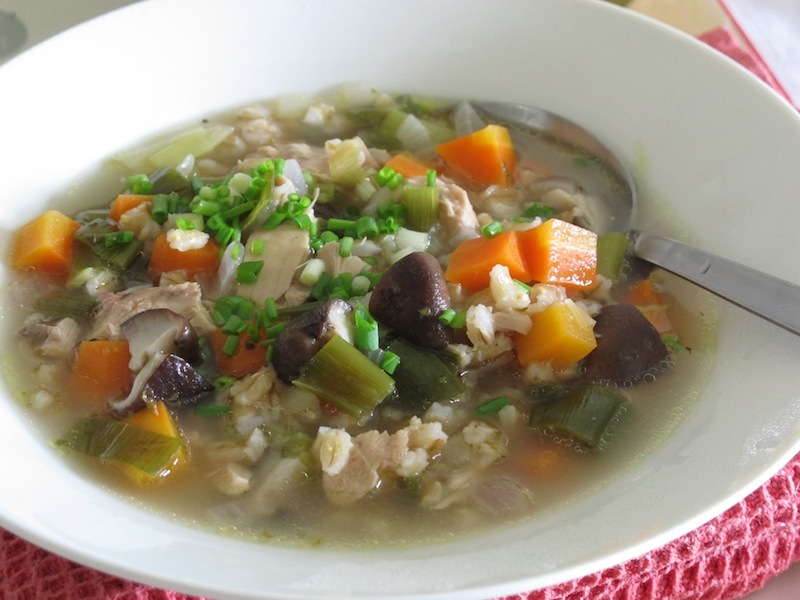 Stir in the stock, then drain the barley and add to the pan. Season with salt and pepper, bring to a boil, lower the heat, cover and simmer for 40 minutes. Add the chicken, mushrooms, carrot, oregano and bay leaf and cook covered for another 30 minutes. Remove bay leaf, garnish with spring onion.